Quick post for me as i’ve been running around pretty busy this morning. Started off at the gym this morning, did some cleaning to prepare for the beau’s return tomorrow, and did some packing as after work I’ll be heading to ladies to do our church routine tomorrow. Oh, and I’ve also got a long mid-shift at work today, so wish me a stress free day. Yesterday however wasn’t as stress-free. I pretty much spent all day and night (up till about 330am this morning) trying to get the Iphone IOS 5.0 to first fully download without timing out, and then to load onto my phone as it kept stalling during the backup phase. Both required me to do certain things with first my computer virus software, and then restoring the phone itself in order to get it to load. All I have to say is thank God for Google and troubleshooting. But the one good thing that did come out of my exploits in baby-sitting my phone on a Friday night was that I managed to catch up on the three episodes of Glee that I’ve had rotting on my Tivo. I was a huge fan of Glee it’s first season and came into the second season with much higher hopes. Although the second season was good, it was a lot more dramatic and in your face with the storyline then I liked. Not that the content bothered me, it’s just not what drew me to the show in the first place. I liked it originally because of the music and how well it was blended into the story itself, and that it was fun and airy for the most part. I could let go of worry and care and just lose myself in the fun, whimsy, and awesome voices/songs of the show. The second season just got way too serious too fast and although I still watched the season, the fear of season 3 being the same way just pushed it further off my must-watch list. So now I’m totally glad it took so darn long to update my phone because the first 3 episodes were simply awesome. It feels like a return to form and i’ve fell back in love. The third episode, “Asian F,” was probably the best written episode yet. to think an episode mostly dedicated to Harry Shum Jr’s supporting character Mike Chang would be so darn good. And to think in season one he started out as just an extra on the football team. He was just amazing in this episode. Mercedes has got a great storyline going as well, with them finally addressing her constantly being always set aside in lieu of Rachel. Can’t wait for the next episode where she goes to the dark side and undoubtedly will gain alot more song work! The biggest perk for me was with the love I have for Darren Criss and the two songs he had in the first two episodes. He’s hot, charming, talented and I’m soooo glad to see him in regular clothes more often now. As I have to start getting ready for work now, I’ll leave you all with both of Darren/Blaine’s songs just because (like all the other fan girls and boys), I believe I’m falling in love with him the more I see him. Enjoy! The first is “It’s Not Unusual” by Tom Jones, and the second is from the musical West Side Story – “Something’s Coming.” For good measure I’m gonna throw in Mike Chang’s first real big solo song “Cool,” also from West Side Story. Catching up on my love of the Sing-Off, I thought I’d give you all my favorite performances from the last two episodes. This is by far my favorite singing competition. Talented singers in so many ways. No instruments, no autotune, just their voices. Lots of preparation, lots of talent, and a whole lot of team effort. Simply amazing. For many years I’ve been a fan of the world within itself that is Disney. More specifically I’ve held quite a bit of fondness for the Disney Villains. Over the years I’ve collected as many items as I could possibly get by mail order, through the Disney Stores (back when they actually sold collectibles that weren’t just toys or mugs), and numerous Happy Meal toys when they were collectible and much better made than they are now. I have a curio cabinet that displays the many porcelain villain figurines I’ve collected over the years. The majority of them are of my favorite Ursula (from The Little Mermaid), but I have quite a few others represented (like Frollo above). 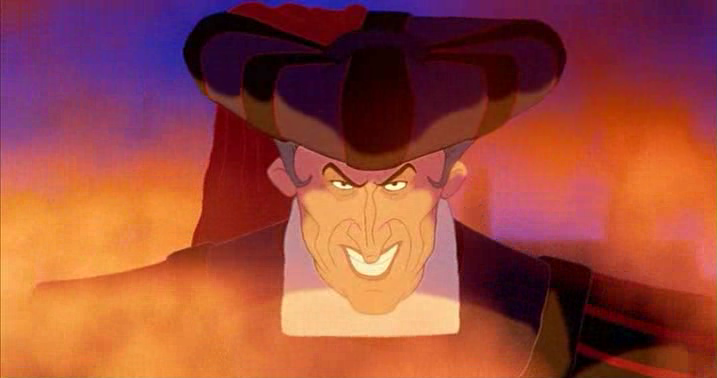 Judge Claude Frollo if you remember is the antagonist in the story and Disney film The Hunchback of Notre Dame. In the movie, he’s portrayed as very religious man who intends to rid Paris of the gypsies who have “invaded” the city. He’s very proud, self-assured, pompous and deems himself a godly man. He also happens to be the caretaker of the hunchback Quasimodo who lives in and cannot stray from the confines of the bell tower. After watching the Hot Topics segment on The View and having a short talk about it with the beau, I had a revelation. 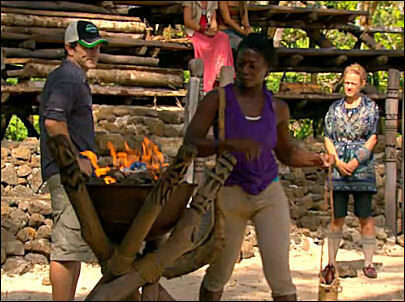 This particular segment I am speaking of was concerning Survivor: South Pacific‘s Brandon Hantz and his fascination/dislike of my girl Mikayla on his tribe. For the past two episodes, he has gave testimonies about how he’s not comfortable being around Mikayla because of feminine wiles, and how he doesn’t trust himself around her. 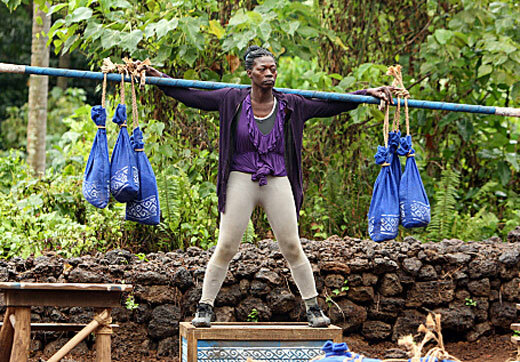 He talks about her flaunting herself and her body around camp to get her way, when in reality she’s just doing what every other girl (and guy) on Survivor has done…walk around in her underwear. Her only fault being that she’s an attractive, strong female…which is not a fault at all. He believes her to be a temptress, but really his issue is that he is the tempted. He’s afraid to be around her because he’s married and may fall prey to getting intimate somehow with her. Which of course is only possible if she were interested (which she’s not), or he would cheat on his wife (which we are led to believe that he may not be strong enough to resist if the “temptress” had her way). To sum it all up, he’s attracted to her and is blaming her for his guilty feelings. To eliminate her means that he would not have to feel tempted anymore, and thus maintain his “good christian” morals. 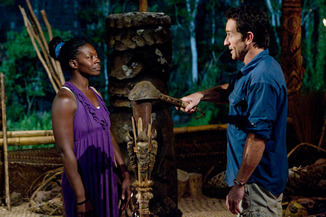 So to avoid this fate he’s been working hard to get the tribe to first see her as a threat (which no one does) and then in the second episode tries to move past the majority and push for her to be voted out (when she’s the strongest female on the tribe). Which as we saw, backfires horribly with nary a vote going her way and Brandon looking like a douche for admitting to an attempt at a blindside without the actual backing. 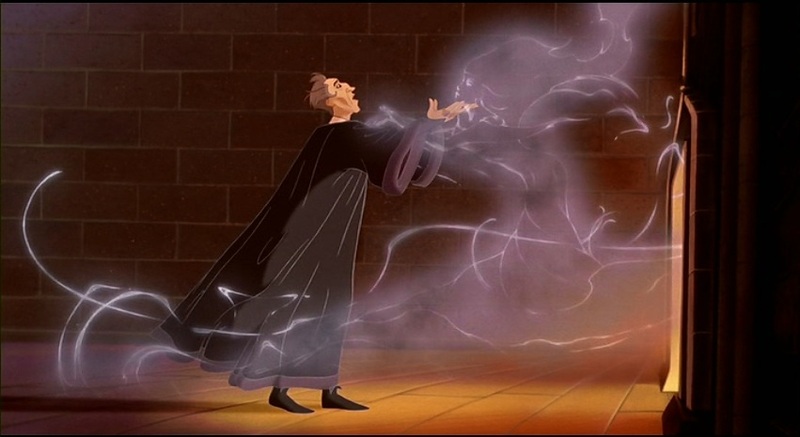 I couldn’t help but think how this situation mirrored the position Judge Frollo put himself in during the movie. He found himself in a position of power, set himself a moral code he must follow which sets himself above a minority of people, becomes lustfully attracted to a strong female he shouldn’t (Esmeralda), blames her for his feelings, and then tries to eliminate her to rid himself of these feelings he doesn’t want to deal with himself. I kind of hope there’s an “aha!” moment for Brandon in the future in which he deals with his issue with attractive women. He has definitely set himself up (and the editors) to look like he holds to the idea that pretty girls who dress themselves attractively (or not in a modest way) are trying to be temptresses and luring men into their arms like sirens. With no fault being on the guy, as he was cast under a spell. I have a feeling that he’ll probably be voted out before that moment happens, but we just have to wait and see. The tandem song “Heaven’s Light / Hellfire” totally came to mind as I was thinking of Brandon and his situation. 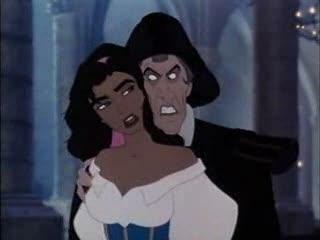 The “Hellfire” portion of the song is Frollo dealing with his feelings towards Esmeralda. It almost fits in perfectly…well, everything but burning down Paris maybe. But who knows how crazy Brandon is gonna get over this. You can catch “Hellfire” starting at 2:07ish, but the “Heaven’s Light” part is just as pretty and much more wholesome.